Posted September 10, 2018 by Charles Morris & filed under Newswire, The Infrastructure. The 9th International CharIN Testing Symposium, dedicated to grid integration challenges, will take place between the 11th and 13th of September at NextEnergy’s headquarters in Detroit. CharIN’s primary objective is to establish the Combined Charging System (CCS) as the global standard for AC and DC charging. Symposium participants will discuss how CCS can be a core technology to enable future smart grid integration. The symposium will bring together diverse players from the smart charging community, including ABB, Bosch, BMW, Fiat Chrysler, Ford, GM, Porsche and Volkswagen. 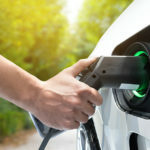 Participants will take part in on-site tests, evaluate charging infrastructure and Electronic Control Units (ECUs), and explore communication between EVs and EVSE. All the chargers at the event will feature a new operating system from Munich- and Detroit-based startup EcoG. The EcoG stack is designed to allow more convenient and faster charger setup and to significantly simplify EVSE operations.